Jumping on the NetEnt and Microgaming bandwagon always boosts the credibility of an online casino. The presence of such remarkably good software effects the way in which a casino is perceived by an outsider. Does it stand the chance of becoming a venue of choice? Slotty Vegas Casino staff is obviously aware of the powerful impact of getting solid software support. It has launched a mobile-supporting website which allows the players to conveniently access their favourite games on smart phones and tablets. 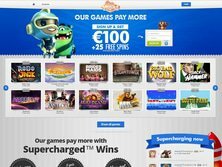 The main page ads showcase some super charged games and promise large rewards for sticking wih the casino in the long-term. A flash-supporting browser is needed to enjoy the embedded entertainment. The same company that is in charge of Slotty Vegas handles Betat Casino, a trusted name in the world of online casinos. The Slotty Vegas Casino Bonus deals definitely don't look like a copy of what other sites are providing at this moment. The casino provides „supercharged wins". Essentially, the supercharge comes in the form of extra funds that get added to the player's overall balance. Loyal players can count on even bigger rewards with the system in place. The superchange is influenced by the type of game that is played. Some games get a better charge than others, so it is important to follow the guidelines on the website. A welcome pack is offered to all new players The deal promises to double the player's initial deposit and provides twenty-five free spins on Aliens and Starburst. A deposit of $/€/£100 allows the player to maximize the bonus and play with $/€/£200. It's good to check the terms and conditions before making an actual deposit. There are some restrictions for players from specific locations. They apply to players who are entering the website from the following countries; France, United States of America, Belgium, Italy, Denmark, Iraq, Afghanistan, Iran, North Korea, Jordan, Kuwait, Syria, South Africa, Hongkong, Taiwan, Philippines and Indonesia. Since the website is licensed in the UK, it draws traffic from a good number of British players. Additionally, the casino welcomes visitors from most parts of Europe and Canada. The casino user gets to decide which currency ($/€/£) will be utilized on the website. Language support is actually very wide. The support is given to speakers of the following languages; Finnish, Swedish, Portugese, Ukrainian, Greek, English, Spanish, Georgian and Russian. The site evidently specializes in delivering video slots. While a specific „popular game" category does not exist, a number of the highlighted titles have been getting the attention of users. Starburst would be a good example. Here is a list of some of the other video slots; South Park, Reel Chaos, Dead or Alive, Terminator 2, Bridesmaids, Battlestar Galactica, Jackhammer, Aliens, Robo Jack, The Dark Knight Rises, Twin Spin, Lost Island, Rabbit in the Hat, Ariana, Temple Quest, Elements: The Awakening, Gold Strike, Game of Thrones, The Invisible Man, Gods of Giza, Tornado: Farm Escape and Muse Wild. No other game categories are highlighted besides video slots. Therefore, the fans of other types of games should look elsewhere. It is great to see an online casino with consistently high rating from visitors. While there have been some accusations against the casino, it appears that everything has been setttled now. Some of the disputed amounts are no longer under dispute. It will be interesting to see whether the casino will continue to improve its public image, or slide down the scale in ratings. It takes work to uphold the image of a good casino. It won't be a cakewalk. NRR Entertainment is the company behind the casino. This company is registered with the Malta Gaming Authority. The casino also has a license from the UK Gambling Commission. In both cases, the licenses are more than sufficient to establish credibility. The casino is willing to come under a process of rigorous examination. It has not attempted to obtain a license from a jurisdiction where accreditation is just a formality. That's a positive sign. I was surprised by the quality of the games and promotions on this website. I believe that the venue can easily rival some of the best casinos that I've seen. The supercharged win can be a fantastic addition to the promotional section of any casino. Who wouldn't want to get extra funds? The fact that I could play such good Microgaming & NetEnt games has also caused me to develop a connection with the casino. 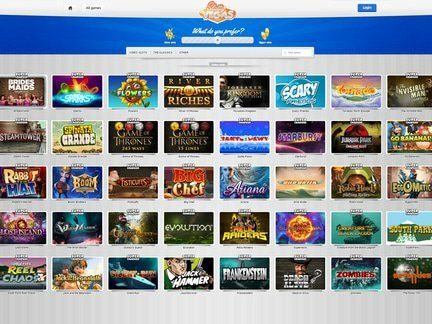 At the same time, the exclusive focus on providing video slots makes it unlikely that I will use this site as the only source of casino entertainment.